The Friends of the Library are committed to promoting literacy throughout our community. 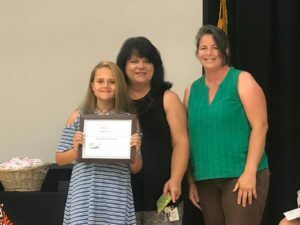 To support that principle, the Friends, working in collaboration with the Queen Anne’s County Public Schools established the Reading Pro award. This award acknowledges one 4th or 5th grade student at each of the six county elementary schools who has demonstrated significant achievement in reading and language arts. 2018 is the third year of the Reading Pro program, and this year’s awards were presented to each student at his or her school by a Friends member at the end of the school year. Each recipient received a certificate and a Barnes & Noble gift card, compliments of the Friends of the Library.